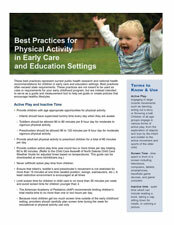 Best practices for physical activity in early care and education settings often exceed state requirements. These practices listed below are not requirements for your early childhood program. They are intended to serve as a guide and measurement tool to help set goals or create policies that encourage healthy lifestyles. This guide is a companion to North Dakota’s Early Learning Guidelines. It offers practical ways parents, families, and early care and education (ECE) providers can encourage children, ages 2 to 5 years old, to engage in more physical activities. All information in this guide is based on current science, research and national best practices. 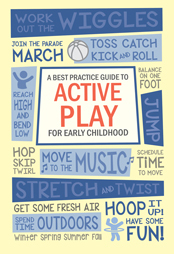 Check out our Physical Activities and Interest Area page for more active play ideas. - Infants should have supervised tummy time every day when they are awake. - Toddlers should be allowed 60 to 90 minutes per 8 hour day for moderate to vigorous physical activity. - Preschoolers should be allowed 90 to 120 minutes per 8 hour day for moderate vigorous physical activity. Provide 60 minutes of adult-led physical activity to preschool children daily. Provide outdoor active play time year-round two or more times per day totaling 60 to 90 minutes.Refer to Child Care Weather Chart to adjust times based on temperatures. Ensure that infant’s, toddler’s and preschooler’s movement is not restricted for more than 15 minutes at one time (seated position, swings, exersaucers, etc.). A least restrictive environment is encouraged at all times. The American Academy of Pediatrics (AAP) recommends limiting children’s total media time to no more than one or two hours per day. Because most children tend to get too much screen time outside of the early childhood setting, it is best practice to limit screen time for children in child care to no more than 30 minutes per week and avoid screen time for children younger than 2. Educate, Entertain and Engage with ChildcareAlive! Always keep safety in mind when creating environments for active play. Always consider safety when creating environments for active play. Make a wide variety of fixed play equipment available that accommodates the needs of all children. Make a large variety of portable play equipment available for children to use at the same time. Make outdoor play equipment freely available to all children at all times and encourage turn taking. Outdoor play space should include open, grassy areas and an area for wheeled toys. Make indoor spaces available for all activities, including physical activity and movement. Encourage children to be active by joining them in active play. Encourage physical activity though the use of posters, pictures, and displayed books. Participate, and ensure staff participates, in training opportunities on physical activity (above and beyond playground safety) two times per year or more. Offer physical activity education opportunities (flyer, newsletter, family fun event, community event, etc.) to parents two times per year or more. Create a written policy on physical activity that is available to staff and parents and routinely followed, including items from the previous four physical activity key areas.